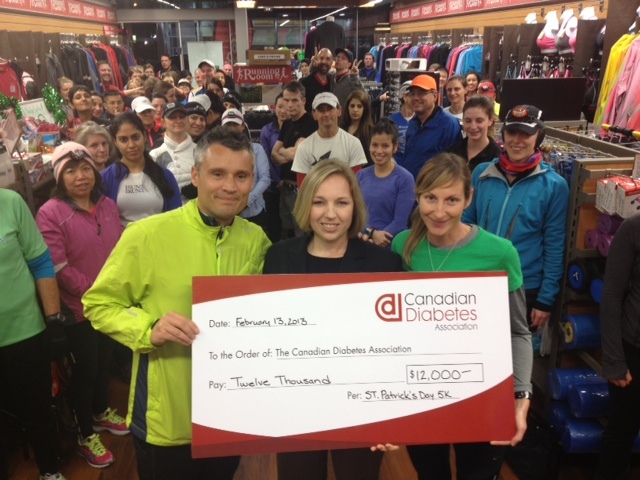 For the past 13 years, the St. Patrick’s Day 5k has been supporting Diabetes Canada with net proceeds from the race going to support the Diabetes Canada. Did you know that money raised from this event has helped send kids with diabetes to camp! Donate/Raise $100 or more and you will receive a FREE entry. Click on the donate button, make your donation through the online registration site and then email info@stpatricks5k.com and we will provide you details to register for FREE. The Diabetes Canada is leading the fight against diabetes by helping people with diabetes live healthy lives while working to find a cure. The Association delivers on this mission by providing people with diabetes and healthcare professionals with education and services; advocating on behalf of people with diabetes; supporting research and translating research into practical applications. To date there is no proven way to prevent type 1 diabetes. The onset of type 2 diabetes may be prevented or delayed, through increased physical activity, healthy eating and weight loss. Taking these steps now can lead to a healthier future. Studies have shown that people at risk of type 2 diabetes were able to reduce their risk by 58% by exercising moderately for 30 minutes a day and by losing 5 to 7% of their body weight. In people age 60 and older, the risk was cut by almost 71%. Learn more about diabetes. More than 9 million Canadians live with diabetes or prediabetes. Approximately 338,000 British Columbians have either type 1 or type 2 diabetes. 20 people are diagnosed with diabetes every hour. Diabetes medication and supplies can cost a person $1,000 to $15,000 a year. Help us make even more of an impact. Make a donation! In addition to supporting the cause through your race registration fee, you can also make a donation on-line through this event. All donations of $15 or more are automatically issued a tax receipt. 18 summer camps across Canada for children with type 1 diabetes – two in BC!